Ride along with us as we take Polaris’ reverse trike out for a dash down Angeles Crest Highway in the San Gabriel Mountains outside of Los Angeles. The folks from Polaris say that the impetus to create the Slingshot came from their desire to build a vehicle that could cause a “paradigm shift” in the automotive market. While that certainly has the air of PR hyperbole, it’s not unlike the motivating factors behind the Cam Am Spyder from a few years ago (which is also a reverse trike), and the Slingshot is arguably more successful at that mission. 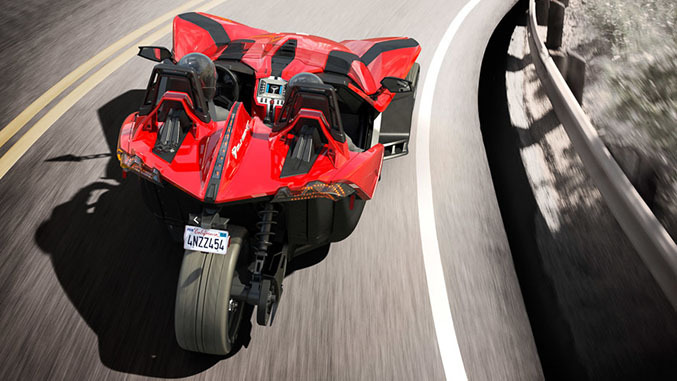 But the driver sits in the Slingshot rather than on top of it, and when paired with the Polaris’ side by side seating configuration, traditional steering wheel, three pedals on the floor and a shifter in the center console, the experience from behind the wheel feels more like an open cockpit car rather than a motorcycle. Dimensionally, the Slingshot sports a 105 inch wheelbase, stands 51.9 inches tall and 77.6 inches wide, while the front track measures 69 inches and the Slingshot rides just 5 inches off the ground. The trike’s tubular steel frame, minimal bodywork and bare-bones cockpit not only contribute to its 1700 pound curb weight, they also allow it to retain some aspects of what makes motorcycles engaging and unique. The windscreen provided on the top-spec SL model does help deflect insects and random debris from meeting your helmet, but otherwise it’s very clear that you’re outside while piloting the Slingshot – you see, hear and smell everything around you at all times. While modern road cars seek to isolate the driver from the outside world, this trike offers the exact opposite experience. The Slingshot’s Ecotec mill generates 173 horsepower and 166 pound-feet of torque, and it's more than enough grunt to make the Polaris a thrilling experience when you dip into the throttle – especially since the exhaust system’s bark is only being filtered from your ears by your helmet. But with all of that power being routed to one contact patch, lighting up the back tire is such an effortless proposition that it occasionally works against the Slingshot. At low speeds in first or second gear, dipping halfway into the throttle is all that’s really required to send the rear tire into a frenzy. The Slingshot includes defeatable traction control as standard but its threshold is fairly high, as the rear tires will still happily spin into smoke whenever horsepower outmatches grip regardless of whether or not traction control is enabled.